My friend Debora is a mentor to me is many ways, including how to "do" Christmas. It's obvious how much she loves this time of year, loves to do things and give things and wrap things and decorate things. She has several Christmas trees - a 9ft main one, a woodland one, one themed for her college son... She had a Christmas tea for girlfriends (actually a couple different ones for different sets of friends) and invited Olivia and me to come. It was right when my busy season was winding down and I was so happy to come and eat scones and mini quiches and have Mr. Dave play with the kids while the gals unwrapped gifts. Among them, gingerbread men for Olivia's feet. It just so happens that she had a gingerbread onesie to be all matchy-matchy. Just as obvious as Debora loving Christmas is that I need to take notes and apply what I learn. We haven't even had a tree for several years. We used to, back when we lived in State College, PA and cut-your-own tree farms were everywhere. 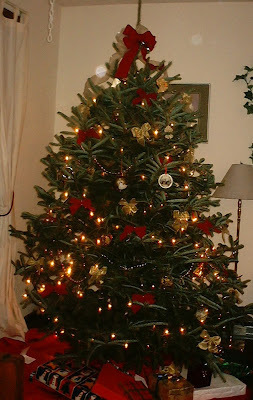 Here is our tree in 2001, a Fraser fir with mostly bows and a handful of ornaments. When we moved to Delaware there were zero Christmas tree farms, and our house was only 16 feet wide anyway. And Christmas became a crazy time of year for me with starting a jewelry business (also thanks to Debora). It got to the point where I didn't like to decorate (much less undecorate) and I wouldn't start to de-stress until I was in the car on the way to upstate New York on Christmas Eve. This year I set a work deadline and stuck to it, so I got to enjoy December for once. Add in the fact that Steve has't had to travel since the first week of December (! ), this month has been such a gift. While we didn't get a tree or put up window lights because those things are intrinsically un-baby-proof, I hung our new ornaments on doorknobs, and on the porch we have an old runner sled with a vintage pair of ice skates and a big bow. And snow! What a quick & easy decoration! We've been collecting ornaments through the years and have quite a stash now, so next year we're planning to have a tree. We even sent out a handful of Christmas cards to friends and family, something we haven't done for several years. We've been playing Christmas music, gone out shopping amongst the Frednecks (instead of ordering everything online), hung out with friends, enjoyed fancy dinners, and look forward to full Christmas dinner with my folks tonight, attending the Christmas Eve service tomorrow night, and being with Steve's family. I hope you have a Merry Christmas as well!